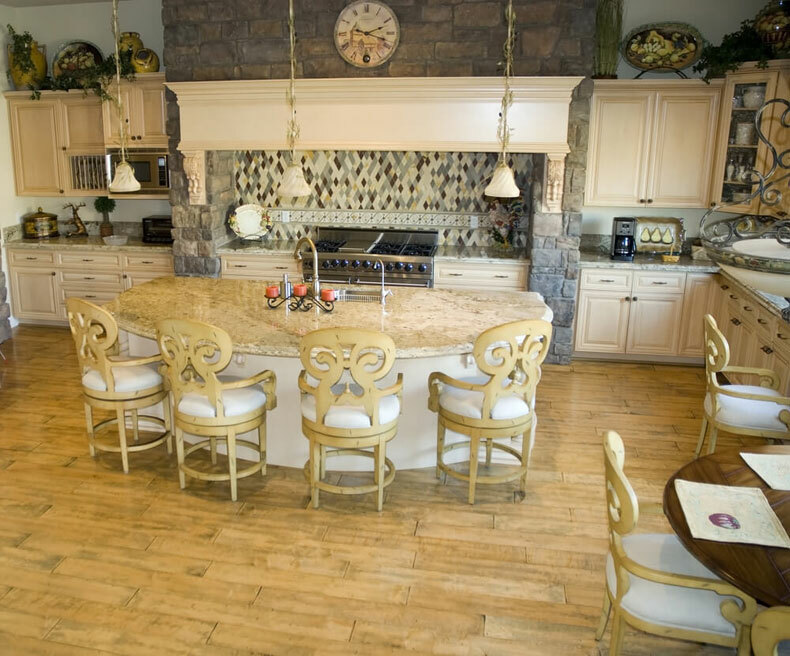 The island is the centerpiece of your kitchen. It’s a place to cook and to gather whether it’s breakfast time or snack time. 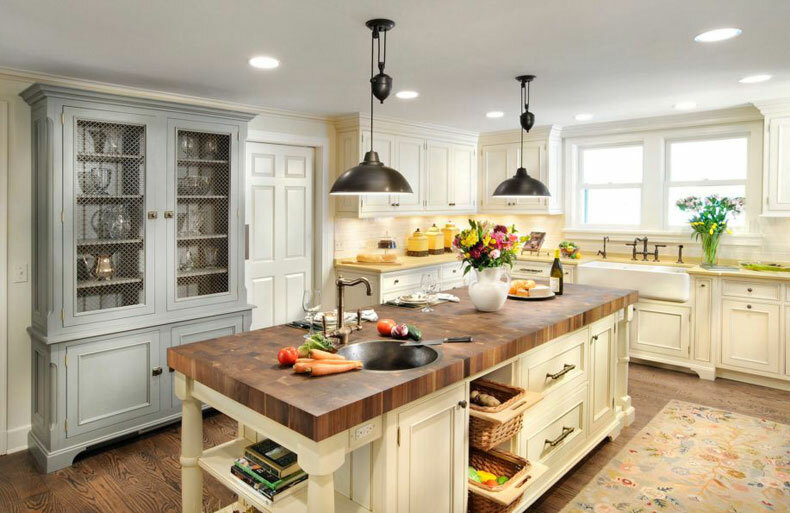 If you’re thinking about revamping your kitchen, this list will point you towards the perfect kitchen island that fits your style and your space. Your style is sleek and minimalist. Clean lines, open spaces, and a palette bordering on monochrome lead to a space that’s just as functional as it is fashionable. 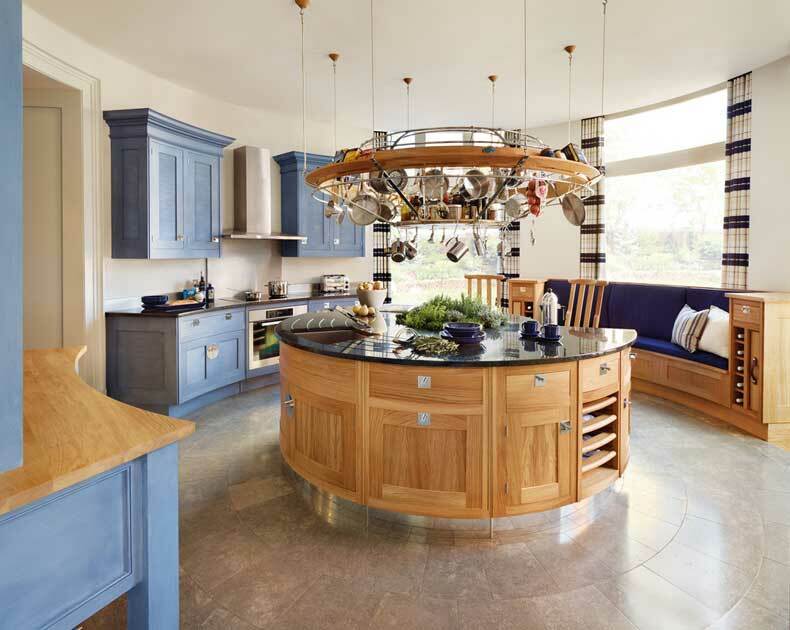 A circular island makes a great choice for a modern kitchen. Given its lack of square angles, it might seem a little impractical if you have to have a lot of storage which makes it great for anyone that wants a clean, clutter-free modern vibe. 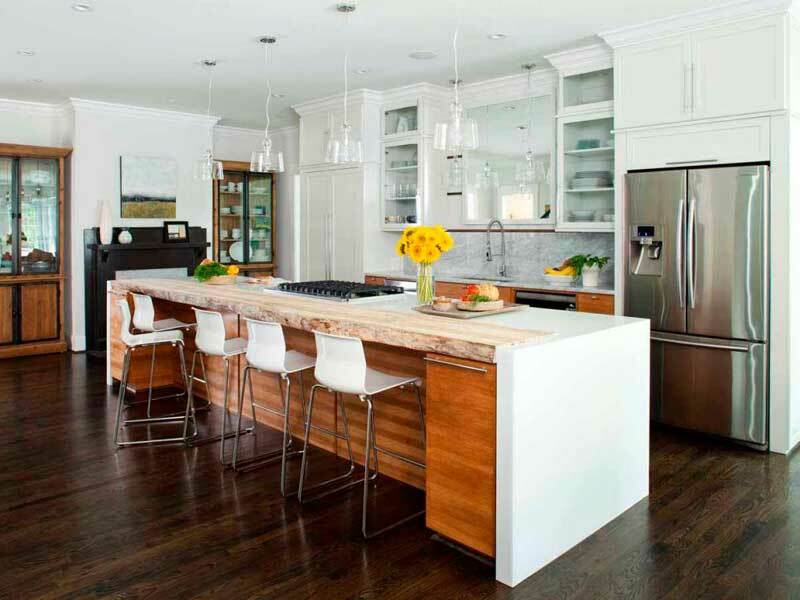 These islands also make great spaces to entertain. If your space is a little tight and you want to make the most of it, don’t overlook the classic galley island. 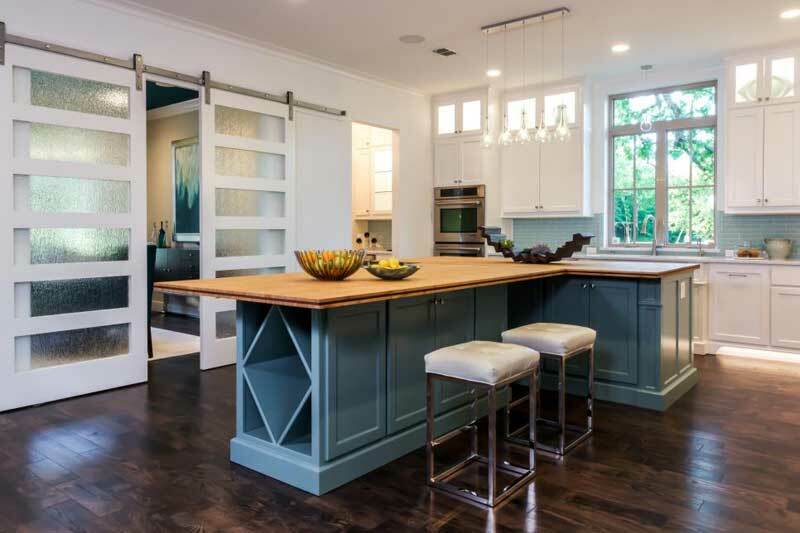 Making your island narrow will keep it in line with your modern style. The rustic style is full of country charm. It’s practical and warm. If this is you I bet you’re going to get a lot of use out of your kitchen. 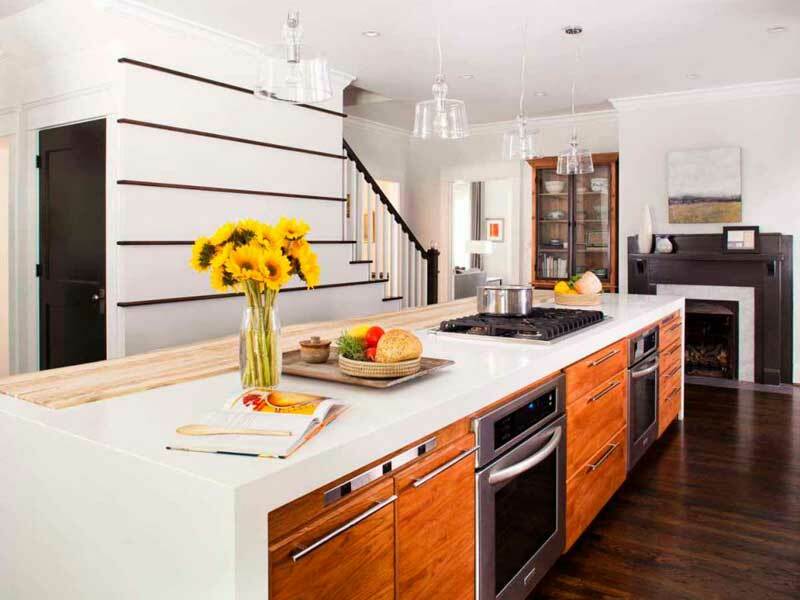 A large butcher block island is the definition of practical. You don’t actually have to use it for butchering but the classic butcher block brought up to island level is a major statement. 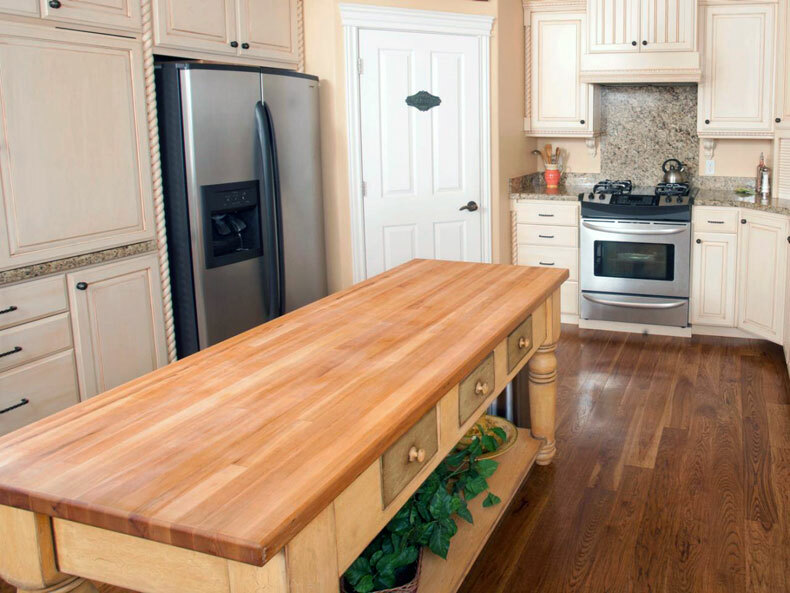 If you want a butcher block but not a massive one consider a galley style island with a butcher block off the end at a slightly lower height. This adds a little flare to your design but keeps everything is the rustic theme. If you’re lacking space then a simple, sturdy piece of furniture can double as your new island. You can choose to add a new counter top or not. Racks added to the bottom can provide extra storage whenever you need it. Your kitchen is the kind of space food bloggers dream about. Here you can whip up a fabulous meal for yourself or your guests. With the right island style, you could host them here, too. The u-shaped island is the ultimate in functional kitchen island styles. You can store all kinds of appliances, gadgets, or pots and pans in the comfortably wide base. 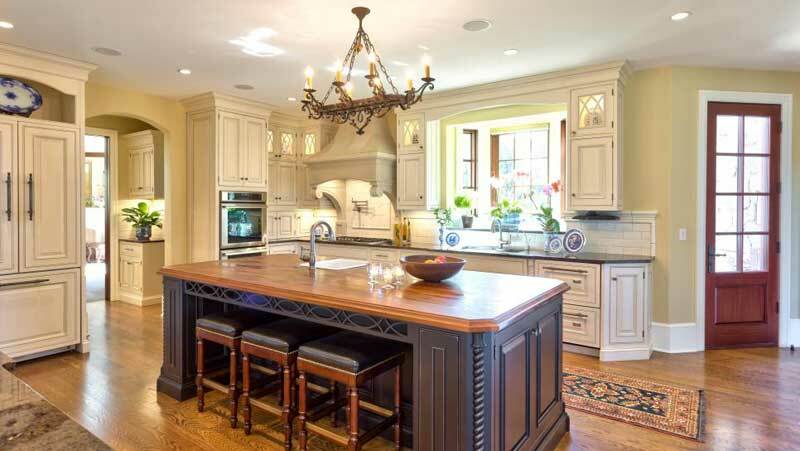 Not only that – if you have a large family, this type of island can seat up to 8 easily. Though not as massive as the U-shaped island, the L-shaped island can be altered to suit your space. You can sit it against a wall, have it extend out into the center or nearly attach it to the other counter tops. The length of the “L” can be altered too. The classic galley- one big rectangle with or without seating. Practical and will fit in anywhere. No frills required. What you choose for finishes and seating will decide how classic you want to go. If your kitchen looks like it was never meant to have an island but you need the extra space, then a rolling island is for you. Roll it out when needed, lock it in place, then roll it back to its out-of-the-way spot when you’re done. You want something different. The playful style is bright, unique and colorful. 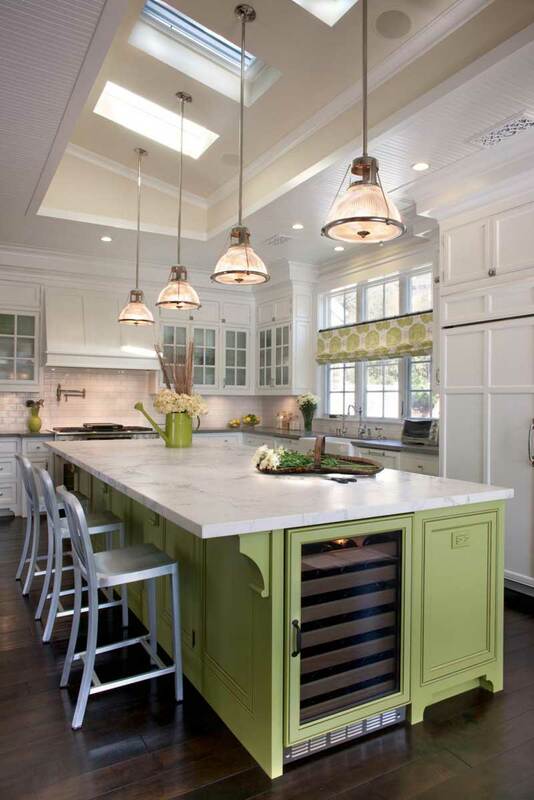 Your kitchen island style just has to match your personality. A multi-level island is many things. It can offer a distinct design, a place for younger children to participate without having to stretch, or extend itself into your dining table. We all know that the kitchen is the heart of the home so why have separate rooms for cooking and eating? A great choice for an eat in kitchen. Rounded is a nice change of pace from square everything all the time. It won’t cut in on your work space if you decide to round the ledge on the eating side only. This is what differentiates it from a circular island. 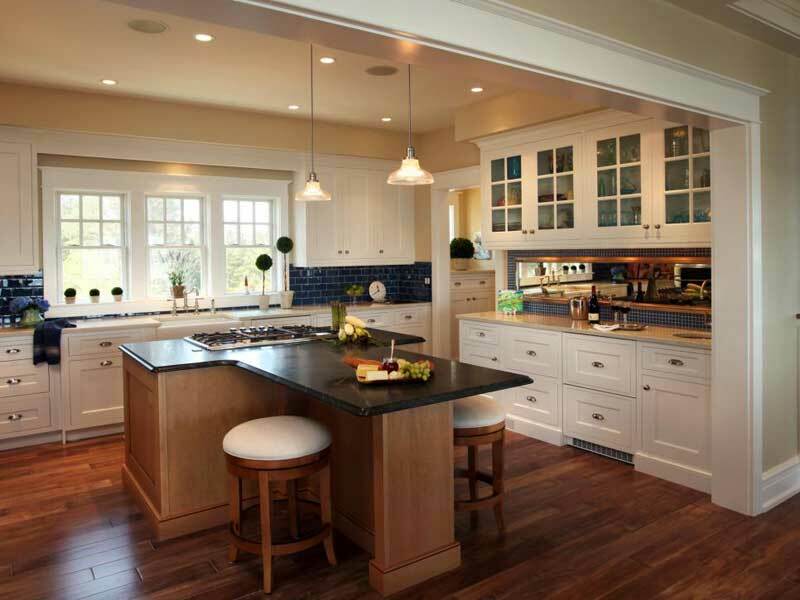 If you’re going for a craftsman kitchen your style focuses on simple charms. Furniture in richly hued woods, custom tiles and little built-in features unique to your home. The hallmark of craftsman style is simplicity. What could be simpler than a square? The spacious counter top will give even the busiest cooks plenty of space. The wide, deep cupboards this island provides will hide even the bulkiest of pots or small appliances while still keeping them in easy reach. 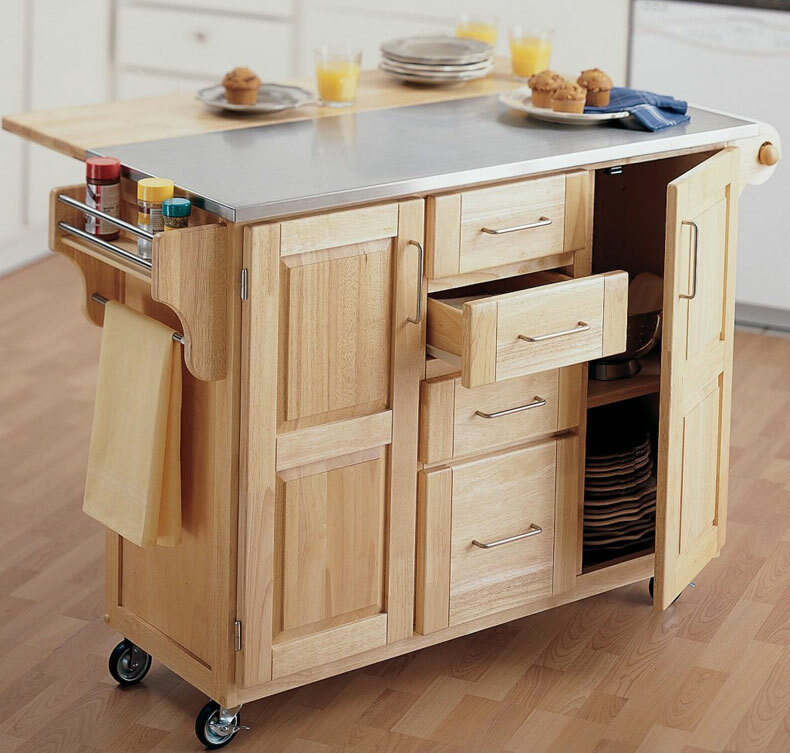 No style fits the bill for a cart style island like craftsman. Make sure you can lock the cart in place when you need to. Trying to knead bread on something that keeps rolling away will give you a pretty good workout but might be a bit much day-to-day. 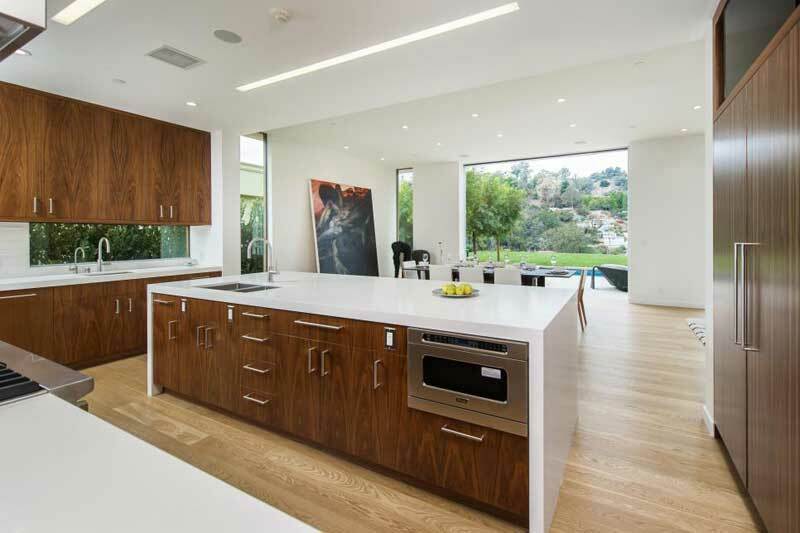 Choose a sleek counter top and forgo cabinet space in favor of futuristic minimalism. The right seating will make all the difference. If you can, combine your dining room and kitchen to simplify your space. 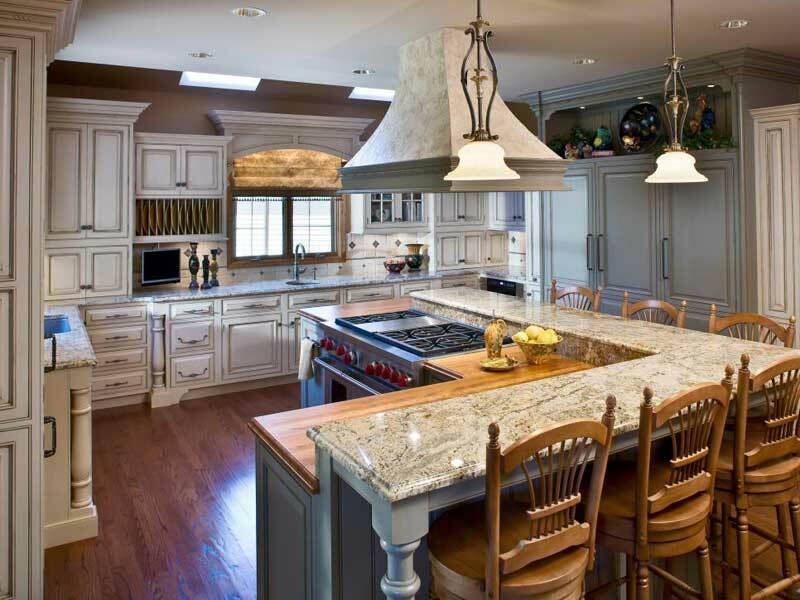 An island like this starts in the middle of the kitchen and gradates out into the larger dining space. The “table” will be a square the same width as the island seating 4 to 6. This guide was meant to help you find the perfect island for your style. That being said, if you see another type of island that just sticks with you as “the perfect fit” under a heading that wasn’t your style, don’t be afraid to change things up. There are so many kitchen island options these days and these 50 are just the tip of a very large iceberg! This design not only optimizes interior space, but it also provides additional convenience for the user. A sophisticated yet rustic appearance is its USP. Its angular design makes it stand out, while the integrated sink helps it to become user friendly. 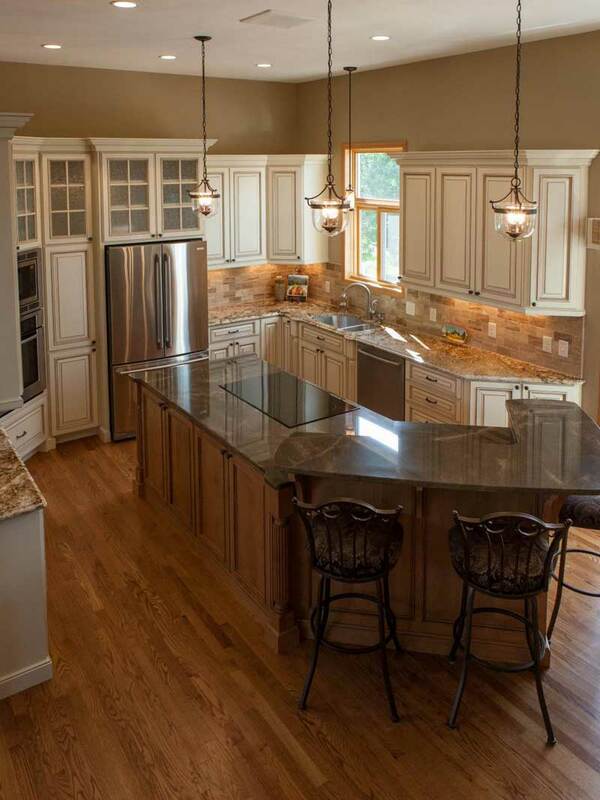 With ample cabinets and shelves, this kitchen design is an awesome deal. 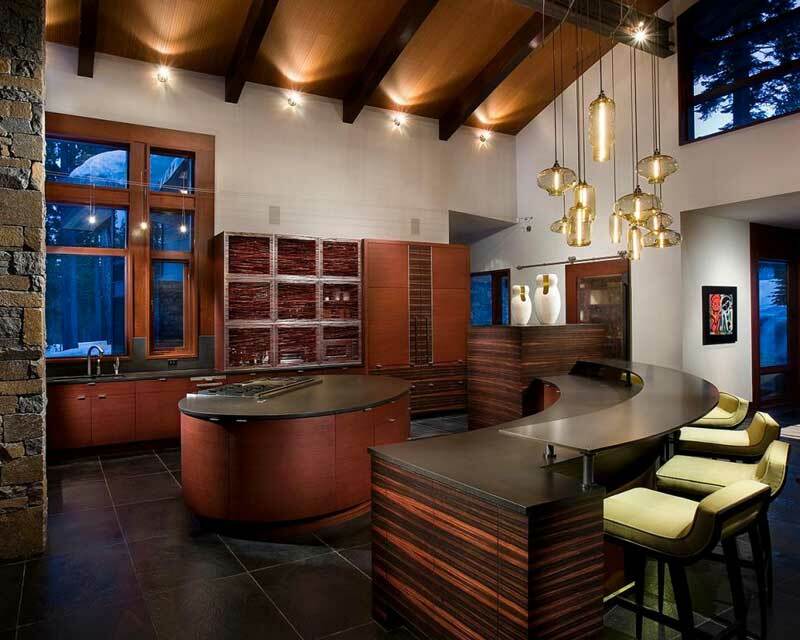 This kitchen design is absolutely classy. Simple yet sober; this is how most of our dream kitchen looks! The contrast of black and white provides a touch of sensuality, while its plain and simple look is undoubtedly a treat to eye. 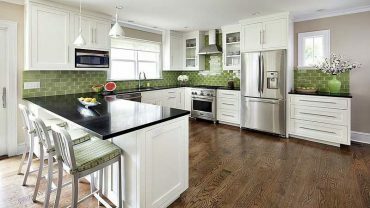 The kitchen is spacious, simple and gorgeous, what more can one ask for in a kitchen! 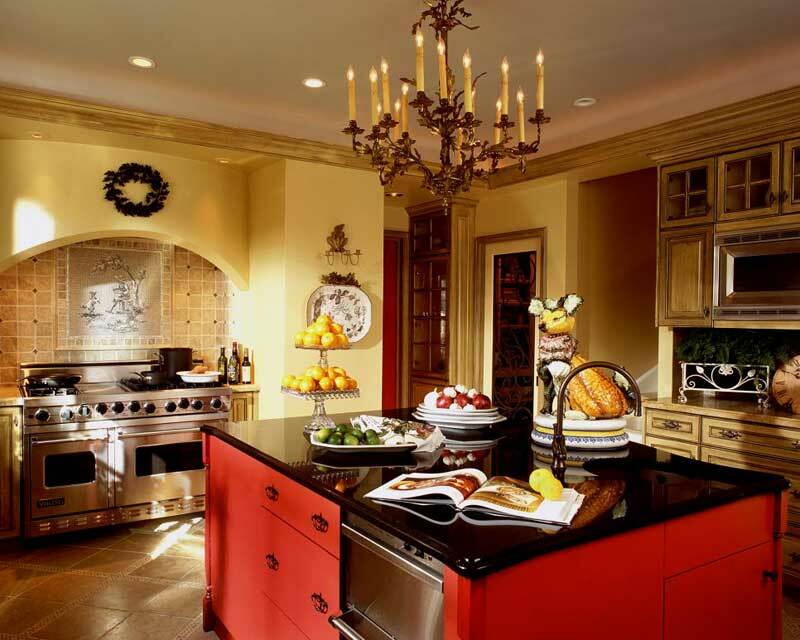 Tasteful and brilliant, that is how one can describe this kitchen design. It instantly appeals to our eyes, and inspires one to spend some time in here. The blue color provides a sober composure, while the marble top offers rigidity. Together, they create a perfect balance of beauty and benefit. The wooden counter top brings us closer to nature, while the blue acts as a vast, deep background. Then there is the dark wood flooring, which looks beautiful in combination with white walls and cabinets. 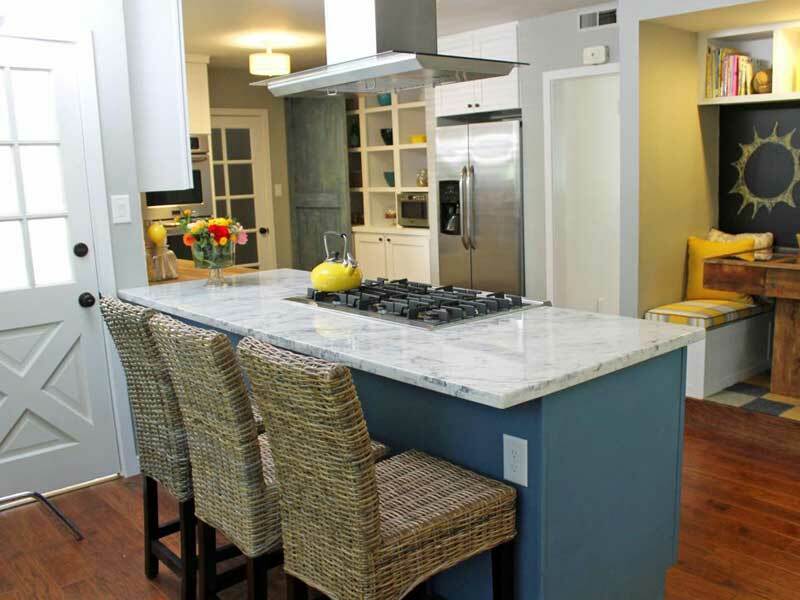 As a focal point, the large, blue kitchen island with a wood countertop adds color to the space. The overall impression is fulfilled with two white leather stools that create an eat-in space at the island.When sensuality matches sensibility, such magic is created. In a word, brilliant! This design creates an ambiance of warmth and transfers the same to the user. Bold, yes, that’s the word to describe this! Exclusive and out-of-this-world, this extraordinary design is meant for extraordinary people like you! 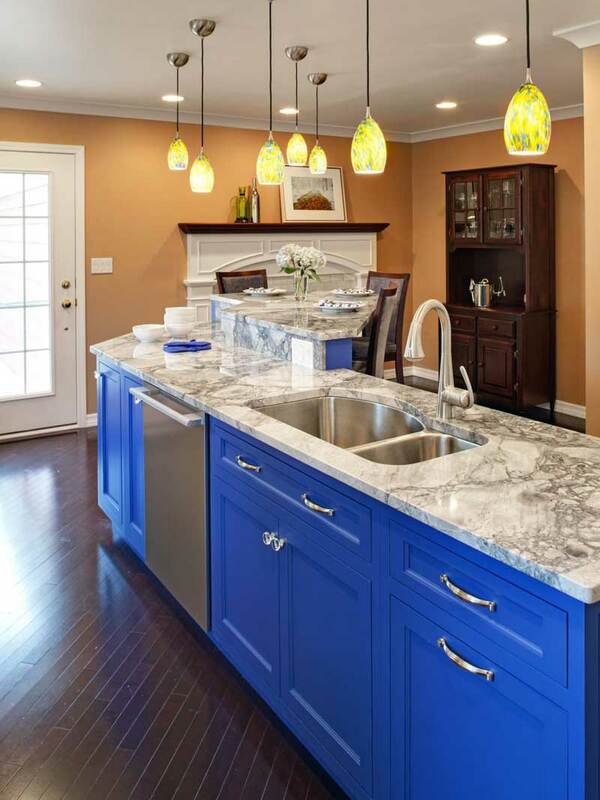 What brings a dramatic pop of color to this kitchen design is the vibrant blue island. 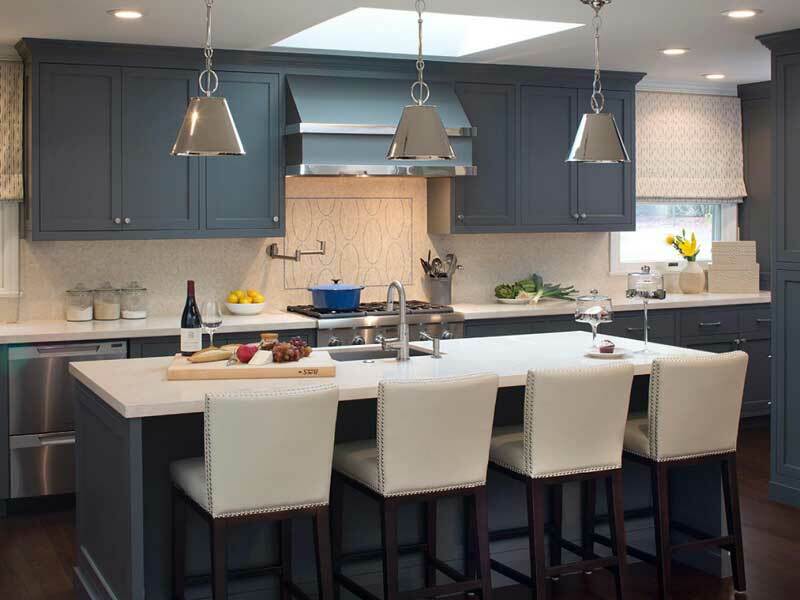 The stainless steel appliances and grey granite top softens the intensify of the color. There is also a white painted fireplace that coordinates with the perimeter cabinets and ties the room together. Casual eating is provided by the raised bar area, perfect for eating with the family as well easy entertaining. The effect is mesmeric. Sheer class! When we talk about modular kitchen, this is what we mean, don’t we? 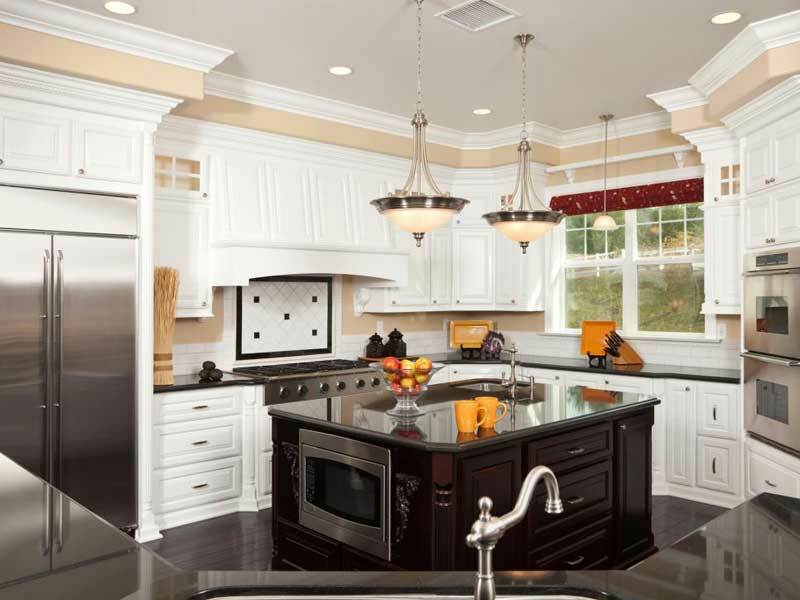 The combination of blond wood cabinets and a large kitchen island makes it spacious, yet convenient. Brown provides a homely, matured touch and this design spells sophistication. This has poetry written in mortar and marble. The dark brown table contrasts with the suave tabletop. This design has all it takes to make its owner feel proud. Beauty, in its truest form! Black is the color of power and authority. This design seals its presence with a stamp of both. It is prominent, yet not loud. Attractive, yet not glossy. This design deserves a thousand salutes. This is an exotic design. Every user is bound to feel happy and relaxed with its appeal; it is so subtle and yet still so inviting! 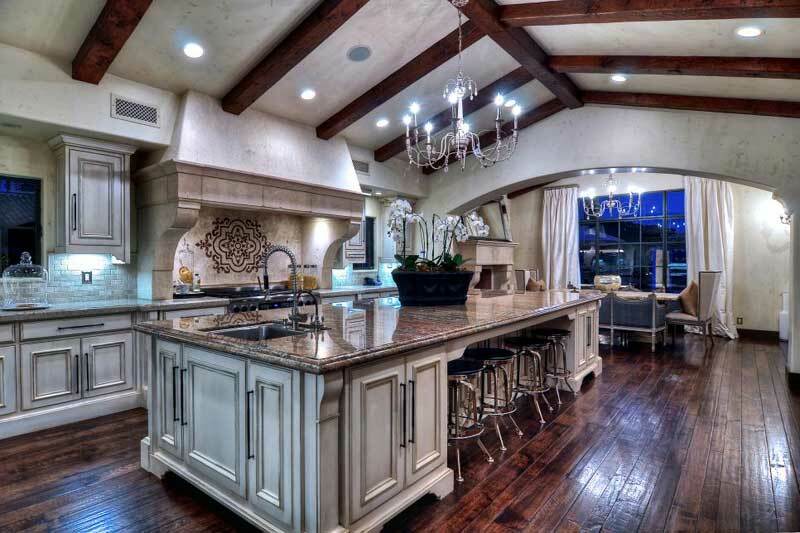 No one would mind spending a couple of hours in this kitchen everyday. Royal. Exquisite. Straight out of a fairy tale. Does one need to say more about this design? The Latin American artwork is complemented with warm wood tones, a custom copper hood and hand-painted Mexican tiles. The granite eating bar and curved shelves of the message center mimic the dynamic curved shape of the island. 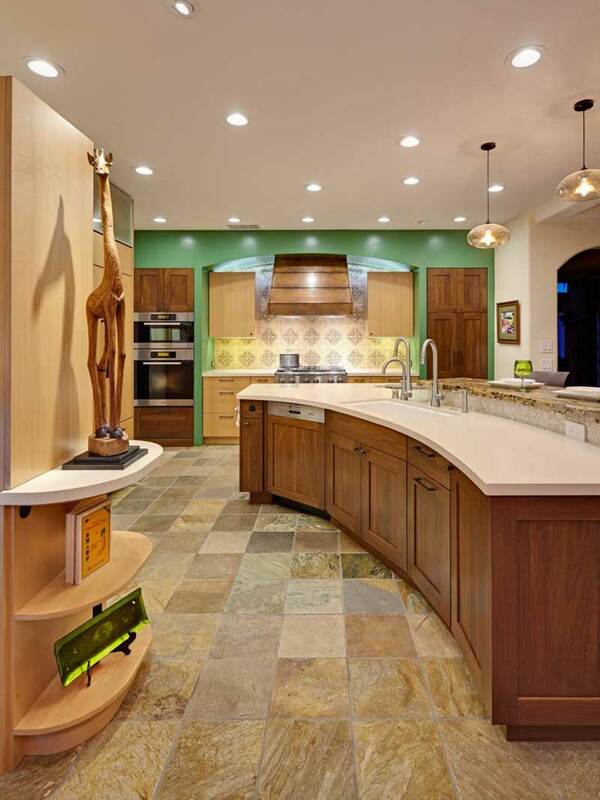 The quartz counter-top and those artistic curves have made it unbelievably beautiful. With a vintage touch, this design stands out for sheer elegance and simplicity. 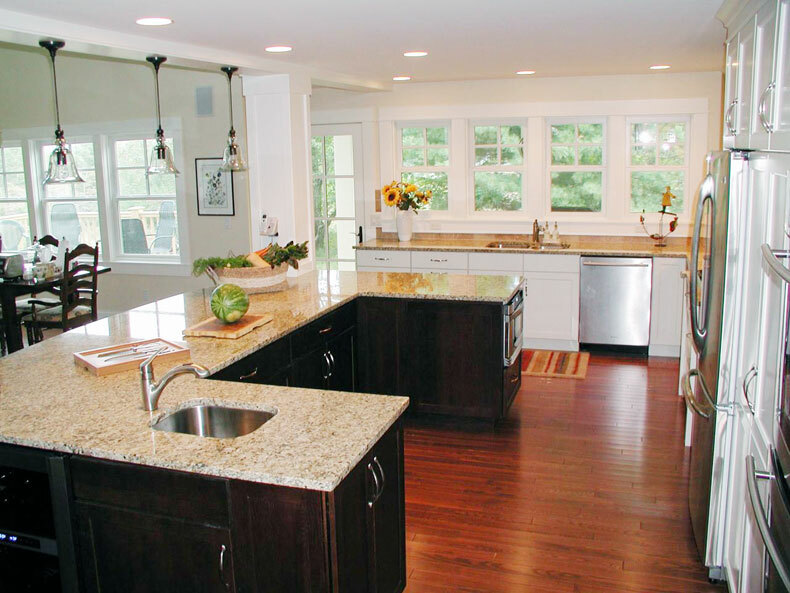 A grounding force is given to this otherwise light and airy traditional kitchen by a dark brown island. There is possibility to pull out wood and leather stools to accommodate kitchen visitors or tuck them neatly away. This kitchen offers the right blend of coziness and eloquence. It is a treat to the eye, indeed! This design breathes beauty. It has a great combination of white and brown, a stunning wooden island and sparkling white cabinets offering plenty of storage. The woodwork creates an ambiance of wilderness, while offering comfort of modern times. The ultimate mix of serenity and convenience, this design is. The kitchen of an emperor should be like this; elegant, spacious and adorable. Its extra long design fits more people, so this is for those friendly people who love odd social gathering! This design is called ‘floating’ for its increased floor space. 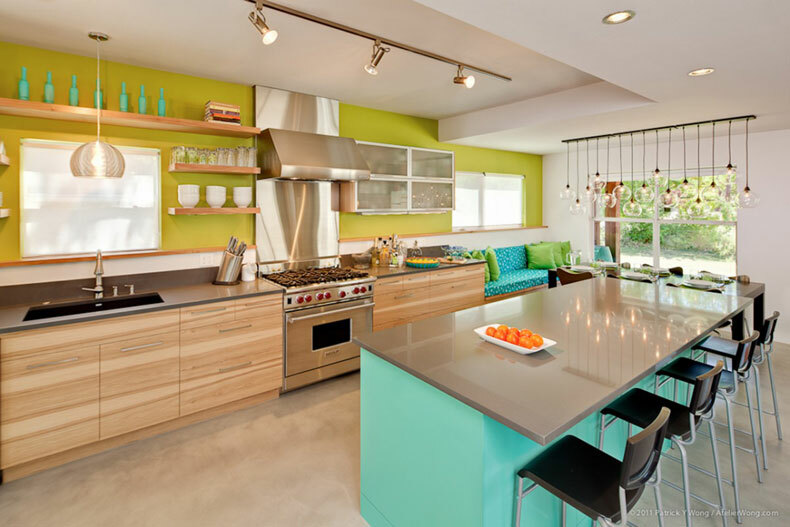 It is difficult to decide what is the most impressive element in this large modern kitchen. Is it the floating, cantilevered, concrete counter peninsula supported by a single beam? The high, painted wood ceilings with exposed beams or the unique wood block back-splash that also separates the kitchen from the dining room? 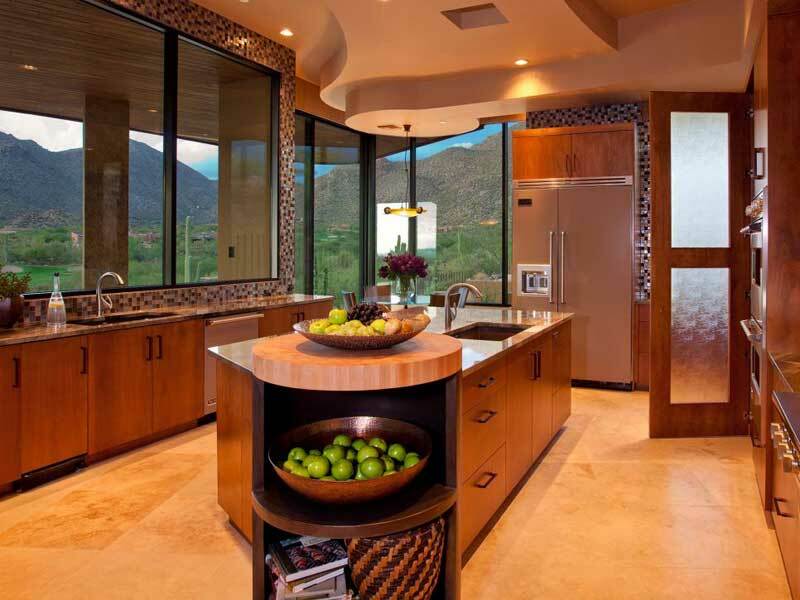 This kitchen design definitely tickles our imagination and sets our minds free. This one comes straight out of the fairy tales. Here we have an example of a massive, solid, white oak kitchen island topped with a 12-foot seamless slab of honed marble. 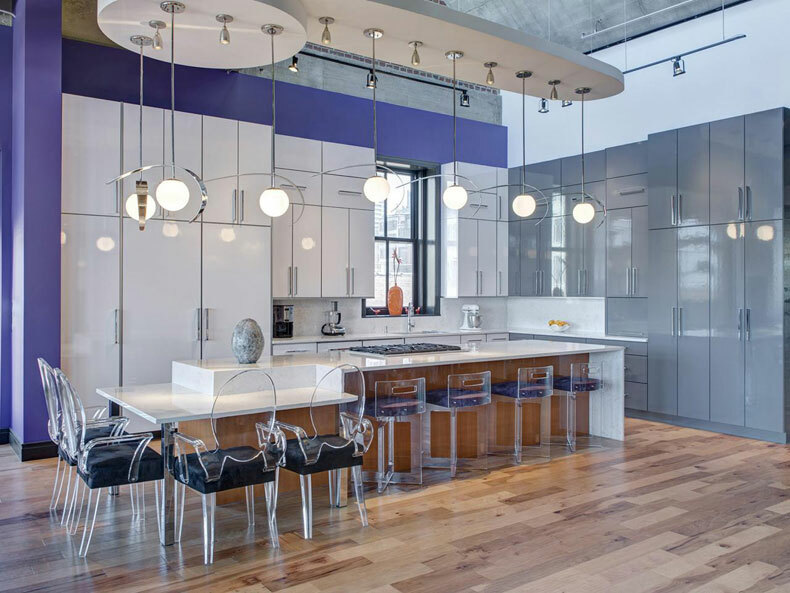 It is coupled with large, industrial-style pendant lights. They give elegance to the whole kitchen; extremely compact but indeed beautiful. The lampshades create a rustic ambiance to a modern design. Awesome! 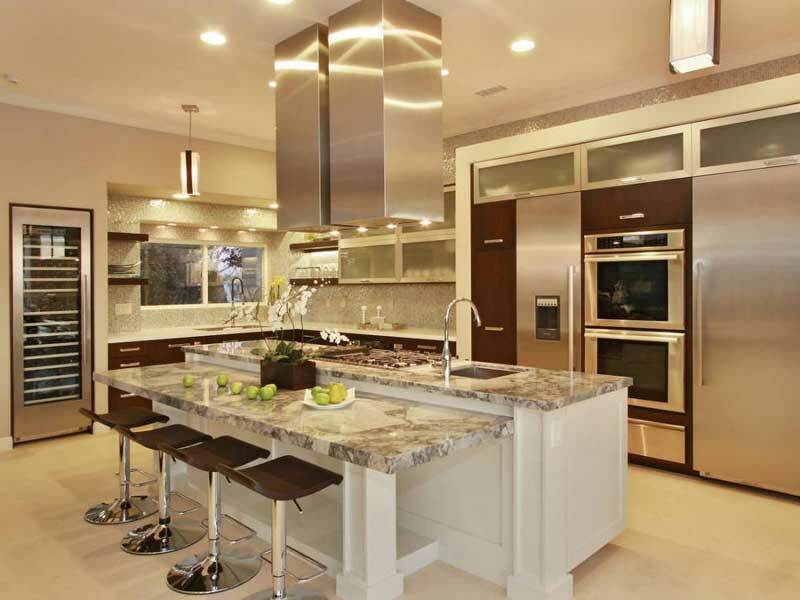 This contemporary kitchen offers a warm atmosphere with hardwood floors, wood cabinets and stone counter-tops. 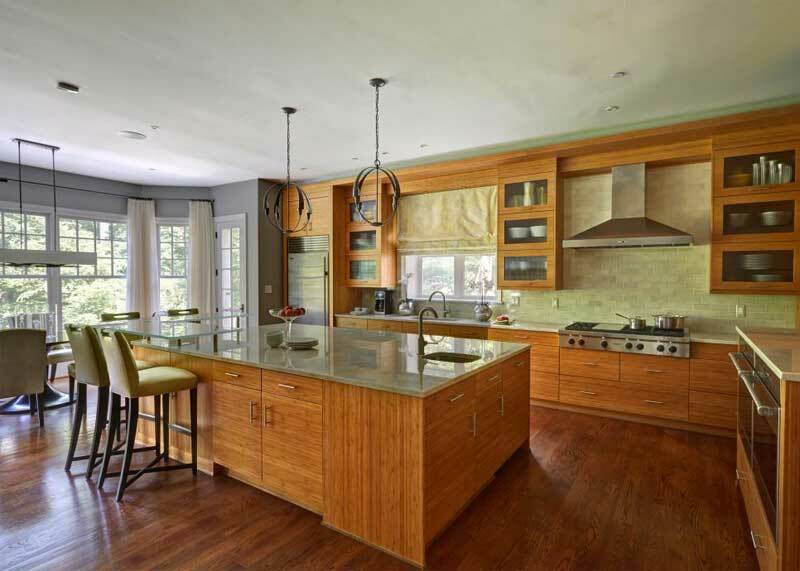 The large kitchen island features a raised glass breakfast bar. It makes this space super functional to accommodate friends and associates, for a quick get together or discussion. This kitchen design means business, as it should be. Its long breakfast bar is spacious, warm and inviting. This is typical Western vintage, with a modern touch. 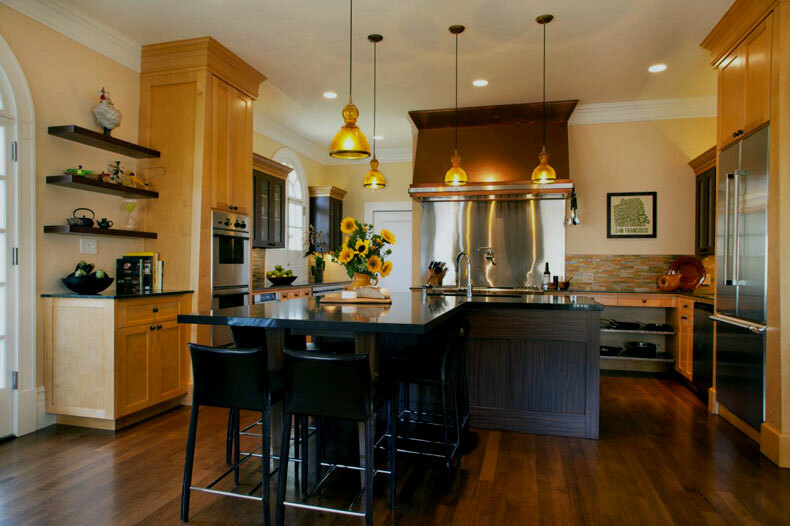 It is a practical eat-in kitchen refreshed with a trio of gold pendant lights above the island, with a butcher block counter-top. There is seating provided at the island with a gray settee, which doubles as a prep station. It looks fabulous and is combined with gray chevron tile back-splash. 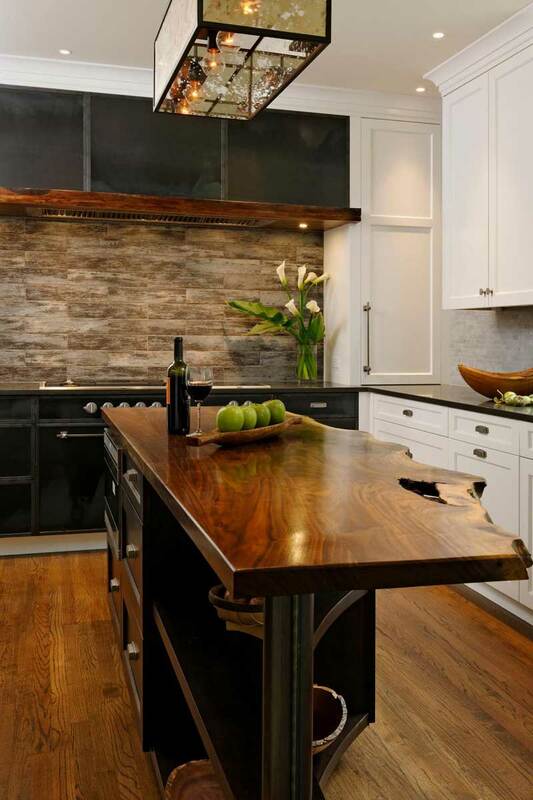 This shimmers behind the stainless steel oven and the butcher block counter-top goes perfectly. A brilliant design, indeed! This is gorgeous. It is strong, yet sober; stubborn, yet stylish. 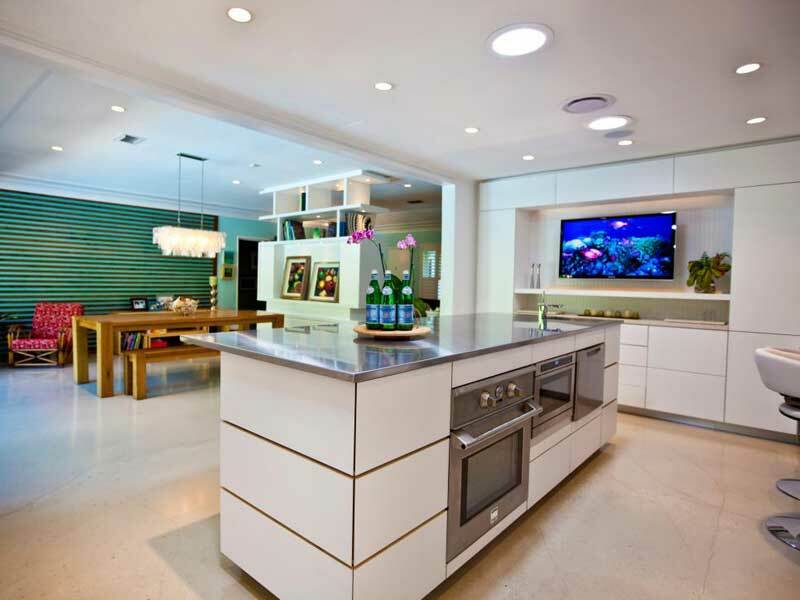 There is a contrast with the island’s granite counter-top, the white cabinets and quartz counter-tops. 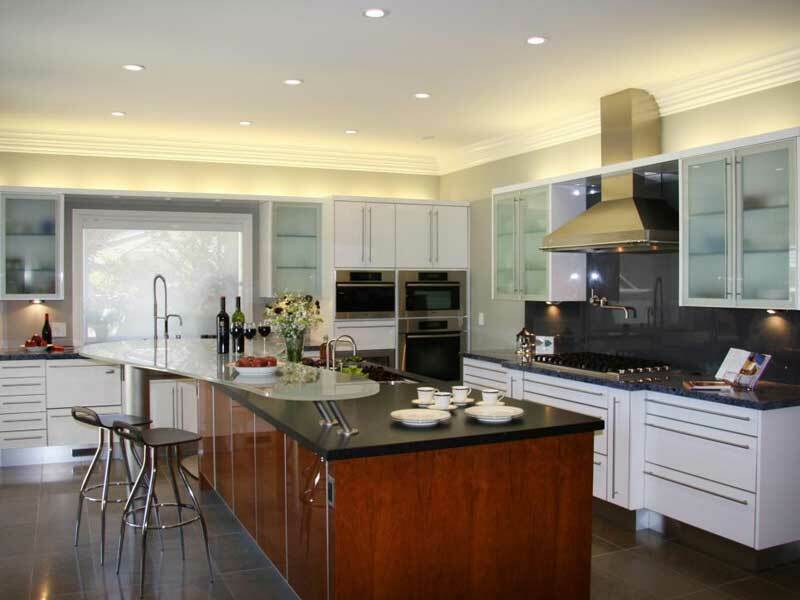 The layered lighting keeps the kitchen brightly lit. This is a very functional, versatile kitchen thanks to multiple sinks and work areas. 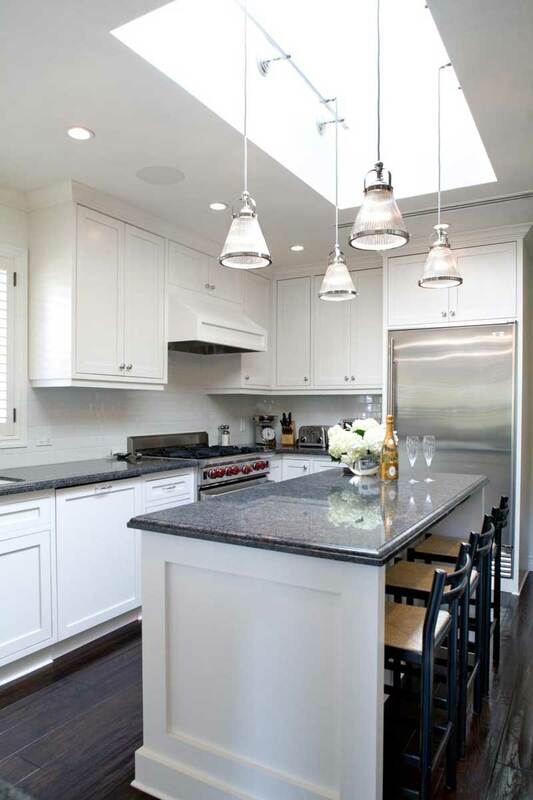 Dark granite counter-tops provide a resilient look. In contrast, white cabinets soothe our eyes. This design stands out, in all aspects. This design has both beauty and comfort mixed in equal proportion. 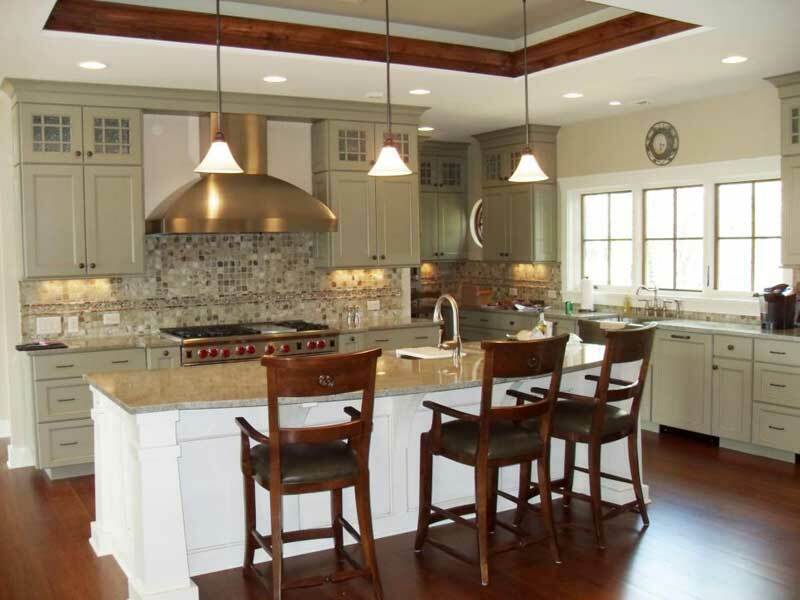 This is a well-lit transitional kitchen with all the amenities; it is a dream for every cooker. It is spacious as well as classy, its double sink improves time utilization and also creates a balance in appearance. Gray is the color of maturity and granite symbolizes strength and stability. Together, it is a sobering combination, in terms of style. This design creates an indelible mark in the mind of the viewer. 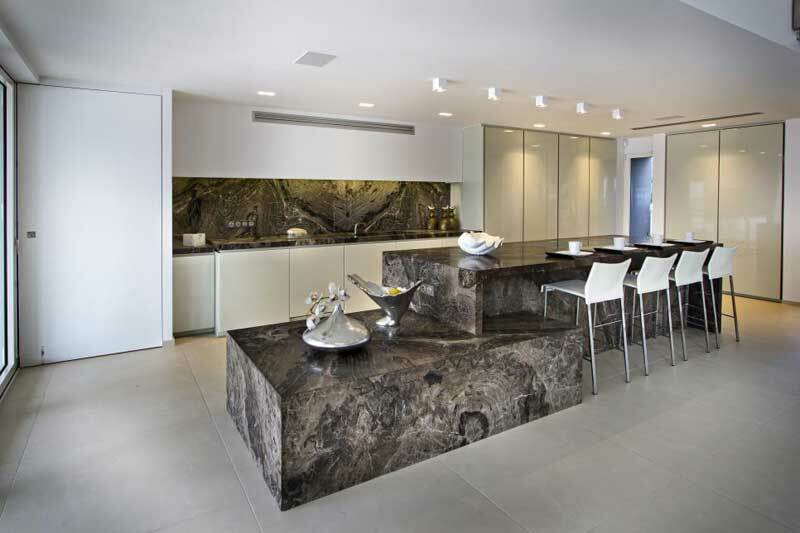 The marble counter-top provides an exotic look. 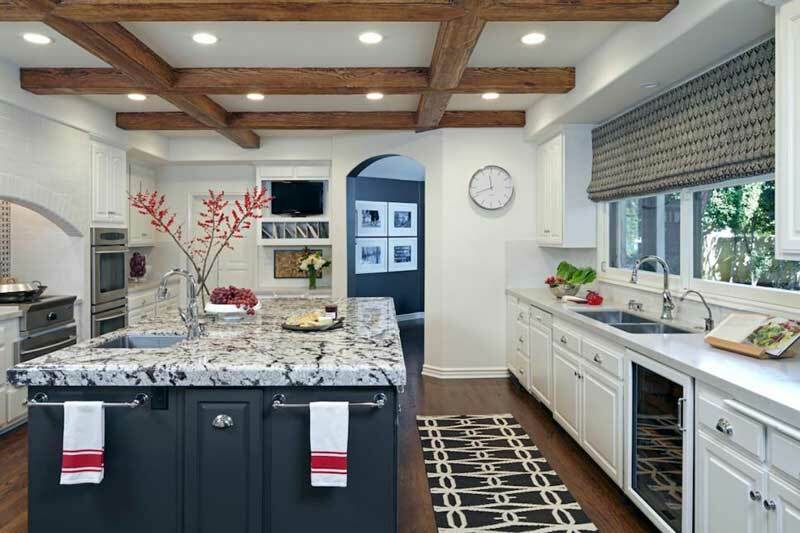 There is a creative idea applied to the ceiling that is lined with a pergola-esque wooden frame, while a patterned black and white rug gives freshness to the hardwood flooring. This kitchen design is for the people with exquisite tastes. It is indeed a breathe of fresh air, in a jungle of concrete; lavish yet restrained beauty. The kitchen is not a place to work alone! Here the combination of the white and gray color is always a good match. 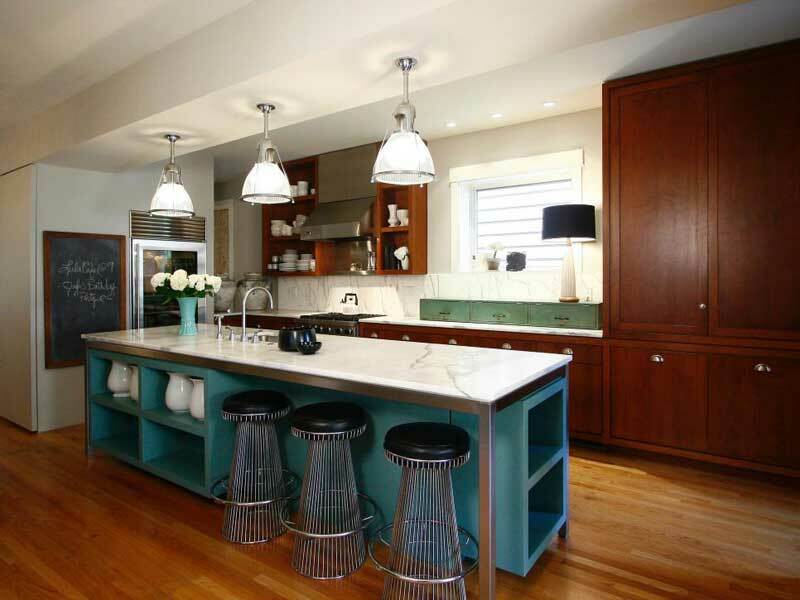 The kitchen island’s integrated faucet is very handy and is also a nice eating place with four white, leather bar stools. Allowing more people to step in will definitely make the atmosphere lively. The custom flush inset cabinets provide a lot of space and is one for all the friendly guys. 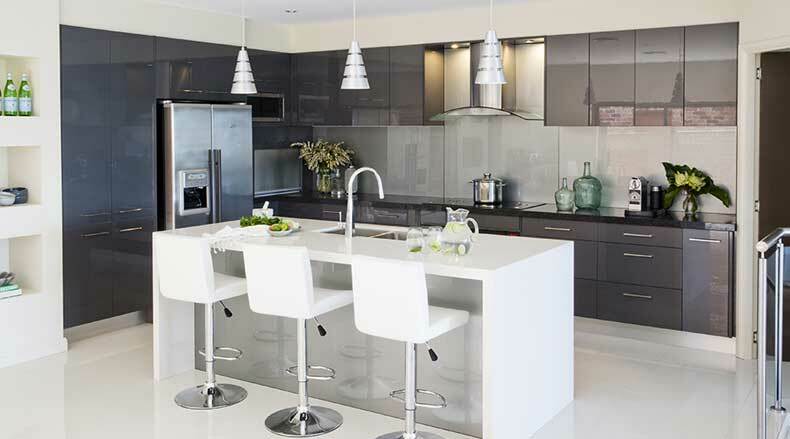 Steel usually denotes a strong resolve and adds to this kitchen’s style. The counter-tops improve on the complete look of the kitchen. It gives a feeling of intensity and strength. This is what the kitchen island design conveys about its user. Walnut countertops are fairy tale stuff. Within a moment, this design can make people feel at ease by its sheer class. This is for those special people who have both the taste and the guts to stand out in a crowd. White brings purity and peace with it. These white marble countertops are always preferred by those who know what style means. Serene. Simple. Superb. This design whispers tranquility. This is a gorgeous design, indeed. 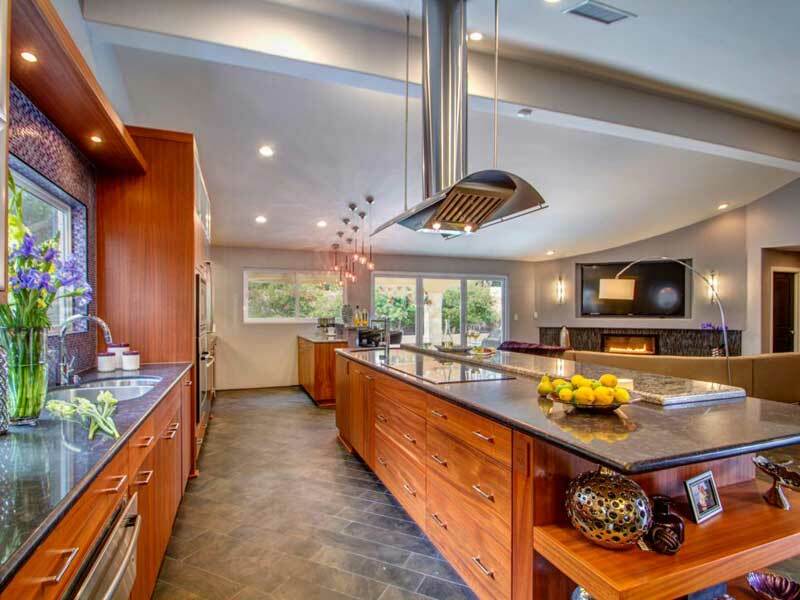 Here we have a beautiful, contemporary kitchen design with an open floor plan and a large island that contains a gas range oven. The wood provides a natural touch, while it has all the modern day amenities. A rare blend of yesterday and tomorrow, that’s the design of today! Space has always been a problem while designing a kitchen. Well, not any more. In combination with daily light and light gray and white tones, this picture provides a pleasant, bright space. The large, gray kitchen island also provides plenty of storage. This design spells abundance. Wide cabinets, spacious interior, and a large heart of the user. Large kitchens are always a blessing. Even better, if it has extra storage capacity. For those who have a habit of storing huge amounts of necessities in the kitchen, this will definitely be the right choice. Besides giving the family more counter space, this large kitchen island also adds plenty of storage. There are plenty of drawers and small cabinets for frequently used items, like silverware and corkscrews. The island also houses a convection oven, convenient for easy baking, and a deep prep sink for easy cleanup. There is a deeper shade to the room over the hardwood flooring thanks to built in wood cabinetry. 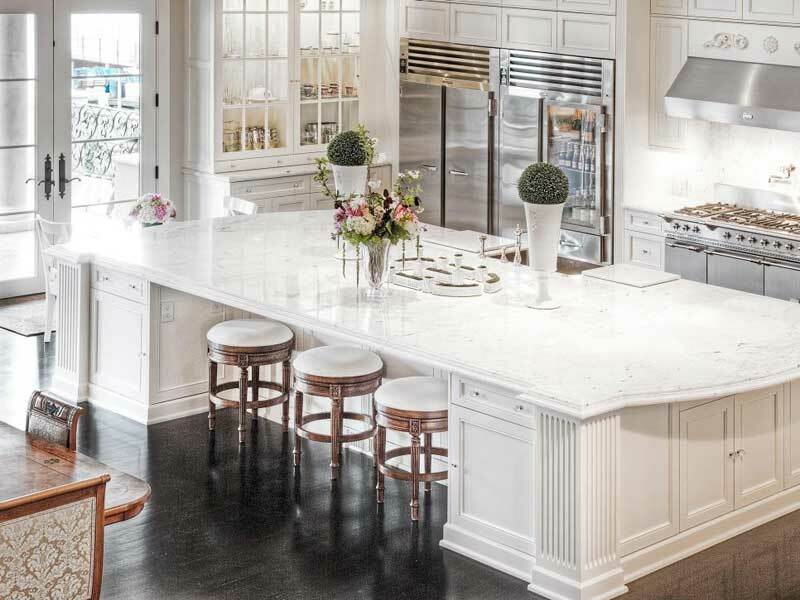 The eat-in area with bar stool seating is consisted of a long kitchen island with white granite counter-top. 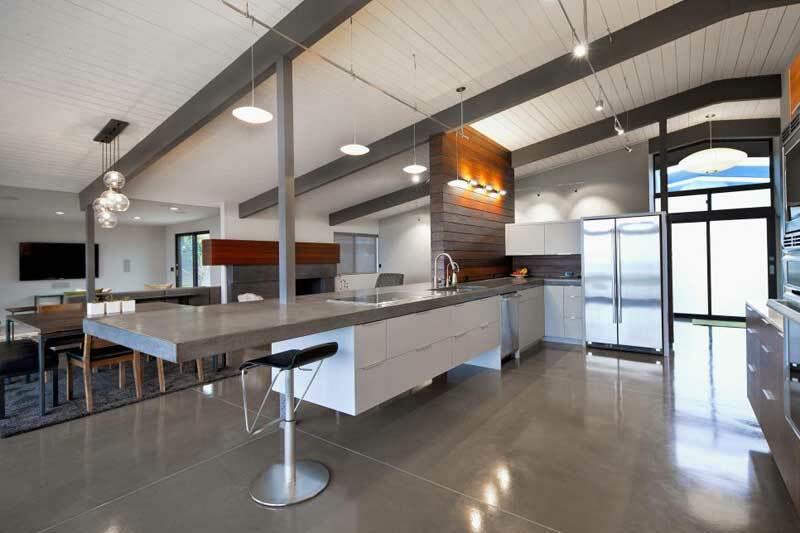 There is natural brightness provided to the space thanks to windows and it reflects off the stainless steel appliances. 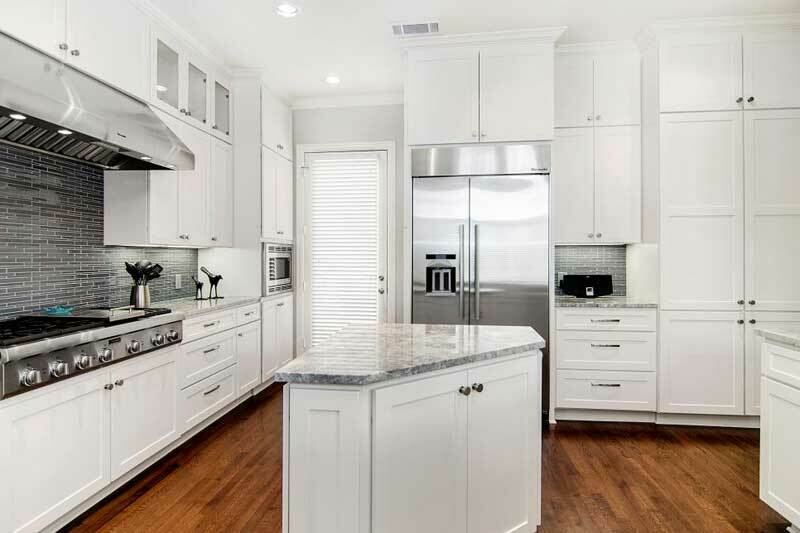 A spacious kitchen with an exquisite white counter top, what more can you ask for! 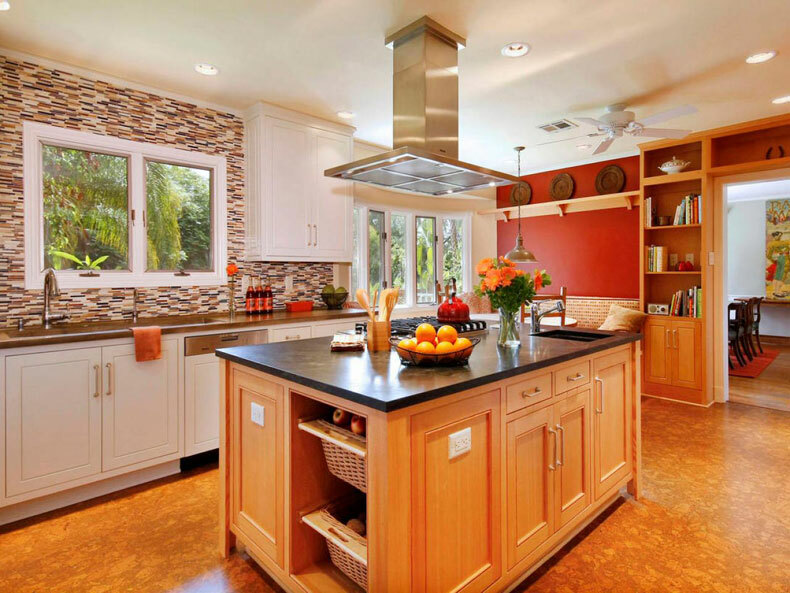 Fit for any holiday resort, this kitchen design is charm incarnated. The double ovens help more than one person to cook at the same time. Still, it does not appear tight due to its length. This saves time and increases convenience. A comfortable user is always a happy user. 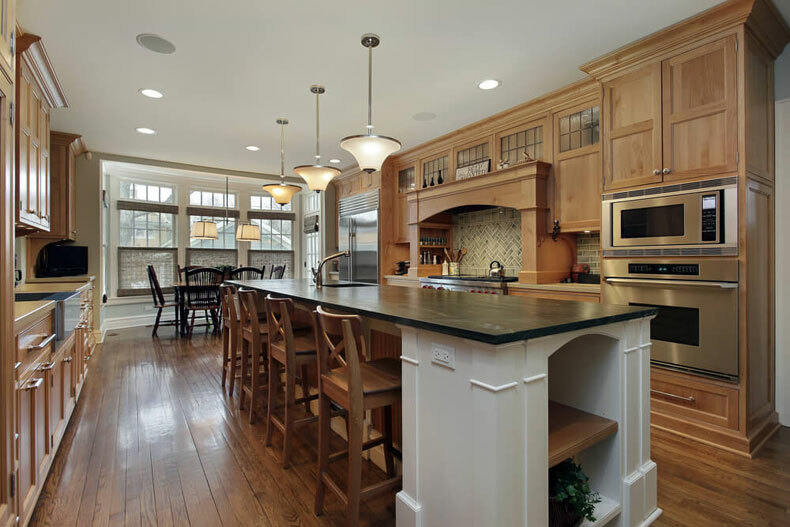 A wide kitchen is always a treat to the eye and comfortable. 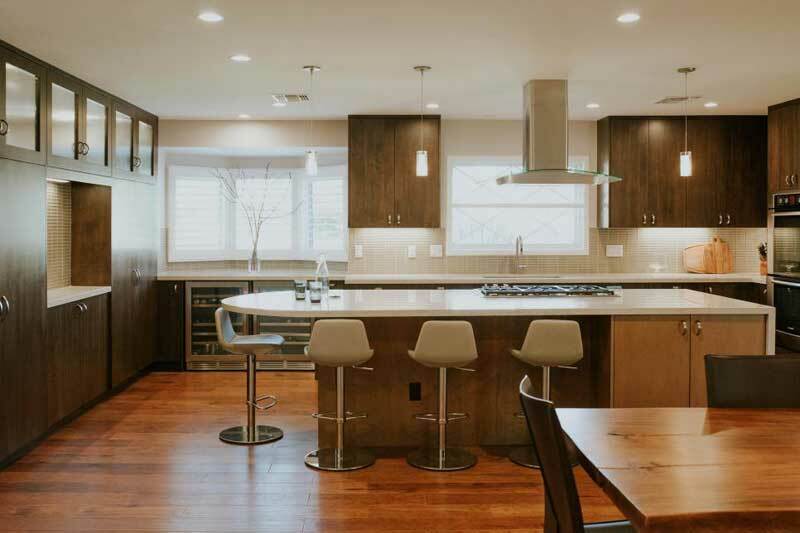 With this long kitchen island there is plenty of work-space and storage in this contemporary kitchen, with an open floor plan. Its wood works are beautiful as well. This design is extremely inviting. This is the example of a zone design that could be useful to break up the different areas of the kitchen. 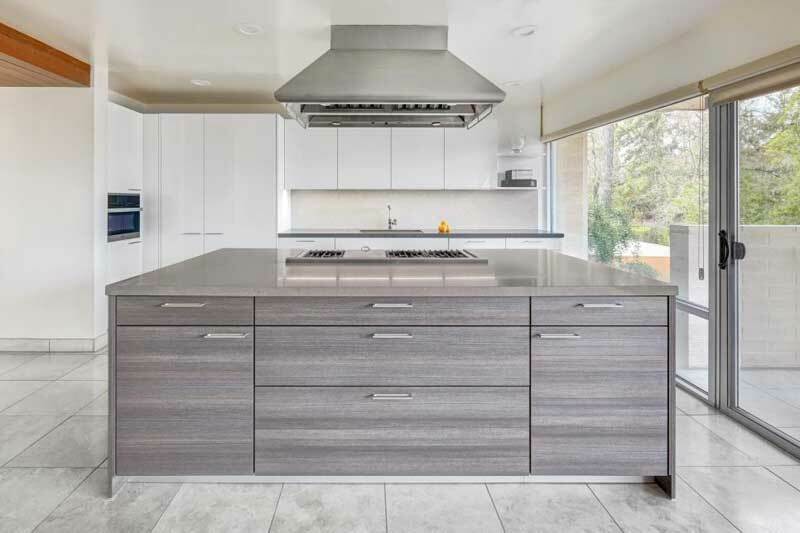 The ‘L’ shaped countertop makes this design unique and unparalleled. Thanks to that, this kitchen has a separate work station for cooking, eating and even cleaning, allowing space for several helpers, all at once. It saves space with a dignified design. This will be to anyone’s liking. This design is gorgeous. It has style, comfort, and convenience. It has everything in the right proportion. Straight out of a dream, this design creates a romantic atmosphere and tickles one’s creative mind. 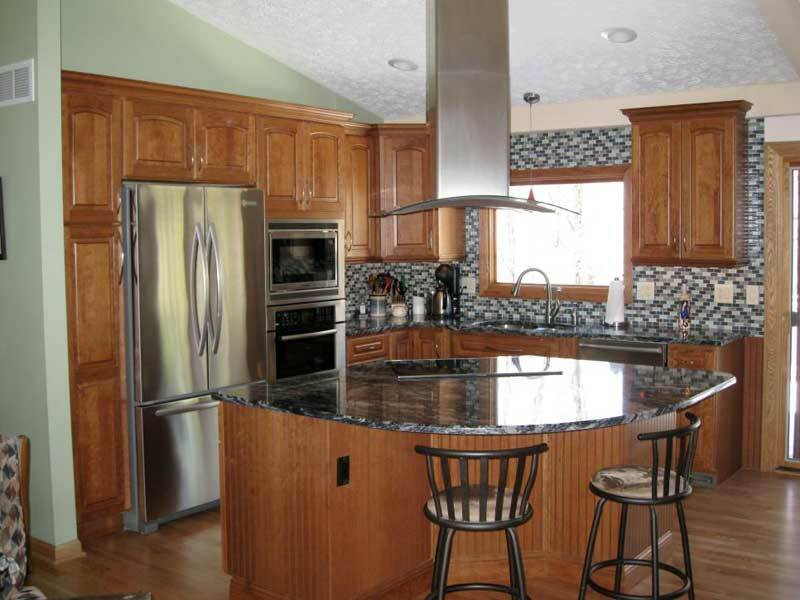 When the strength of granite combines with the subtlety of maple, such a magical design is created. Superior finish and absolutely stylish, this design is for the strong, no-nonsense persons. This kitchen island doesn’t have only a purpose to add an extra counter space for meal preparation, but also provides a dining spot for two. 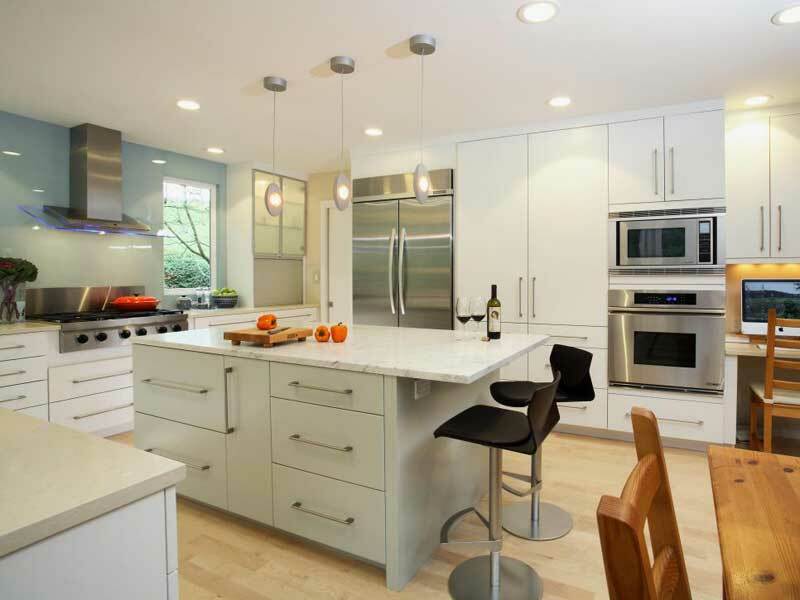 This contemporary space is bright and fresh thanks to the kitchen’s streamlined cabinetry. 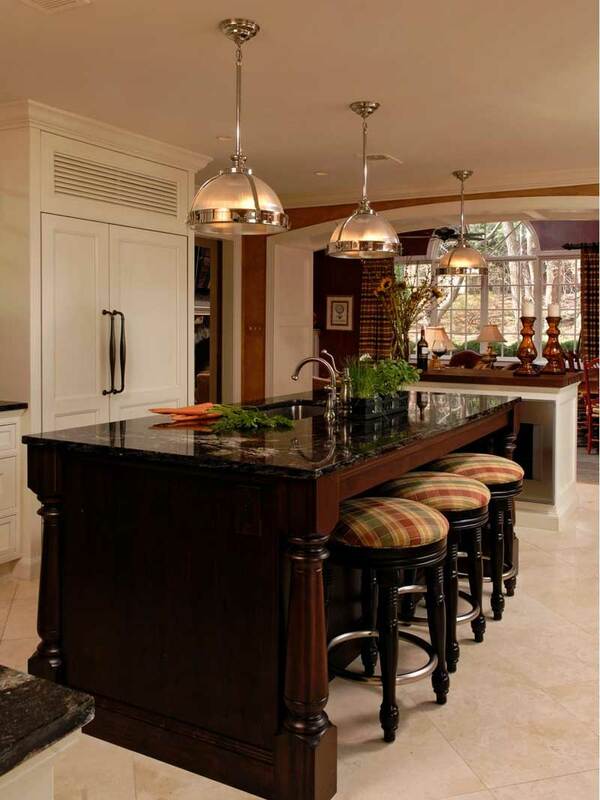 Marble countertop makes this a special design, while modern bar stools provide a contemporary touch. This design is to relax and catch a breather. Inviting, charming and fascinating. Metal provides the strength and wood the softness; together, they create beauty. 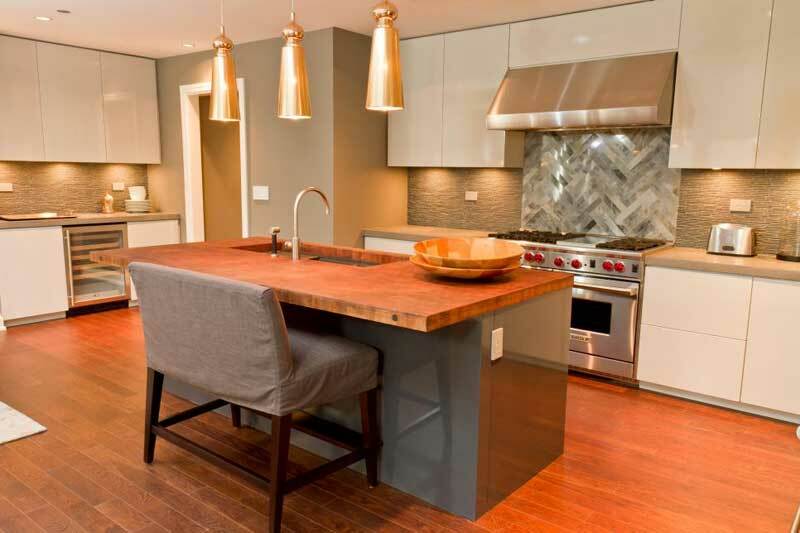 The back part of the island is finished in distressed metal panels, in order to complement the custom metal hood. 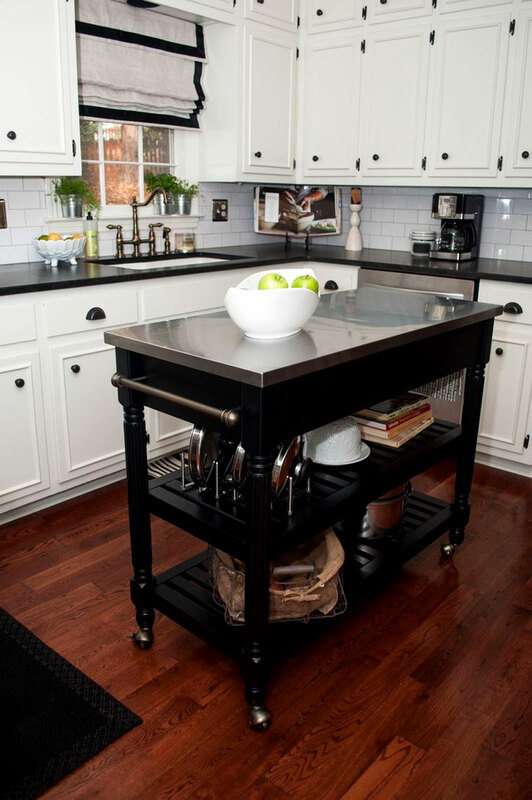 This metal and wood kitchen island is for those who love to live life to the fullest. 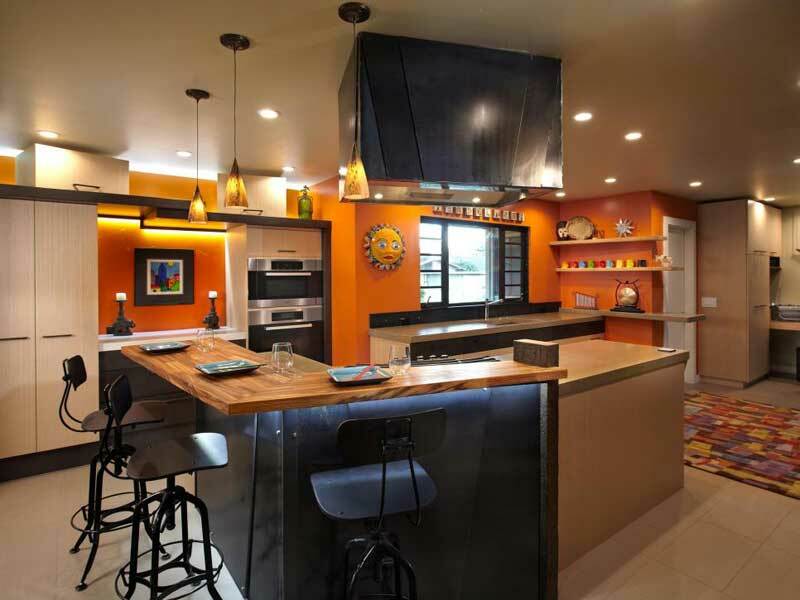 What gives freshness and life to this kitchen are the bright orange walls . This design is for people with contemporary taste and style. This kitchen has seamlessly integrated features. The appliances and cabinets are easy to open while the lowered counter-top at the island is the perfect height for a wheelchair user. Under the counters, two freezer drawers and a microwave drawer are easily accessible. Plush and poignant. Modern design at its best. Multi level support not only adds to convenience, but also creates a new dimension in appearance. Brown stone provides an artistic look. Overall, it’s another superior design for space saving simplicity. Exotic in appearance, easy in usage. The oval shape changes the mood of the user, while also allowing for more interaction with the inmates. Easy access to users, yet a simple and soothing design, it is an unbeatable mix of style, indeed. This is absolutely a superb work of art. 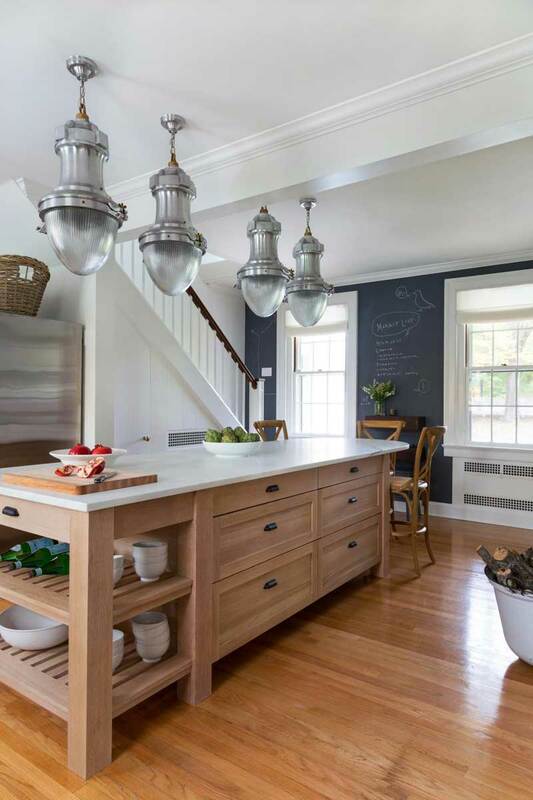 Lights are giving this traditional, farmhouse-style kitchen a special look. 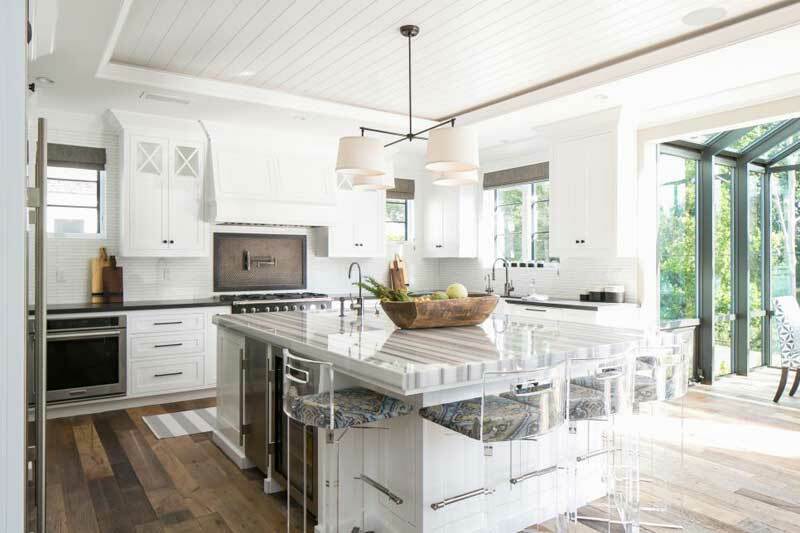 There is a trio of skylights bathing in natural light, while four pendant lights offer plenty of task lighting for the island breakfast bar. 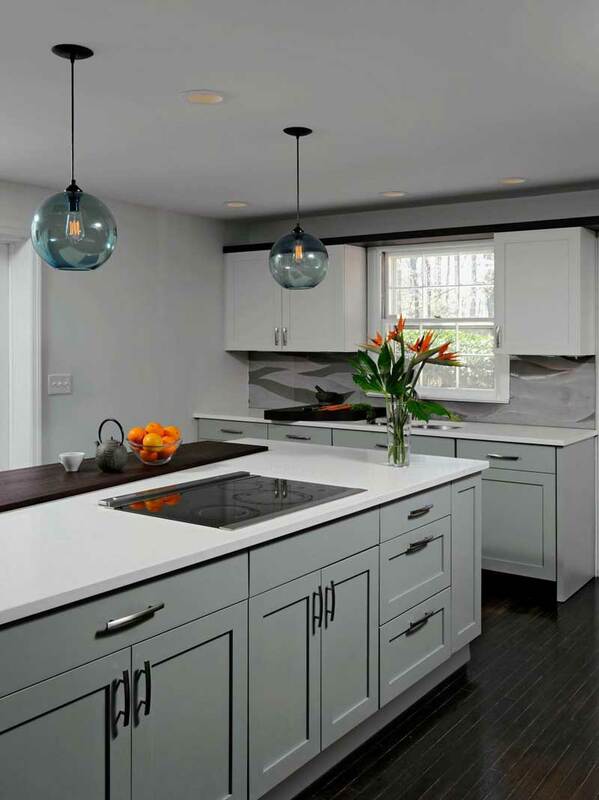 Pendant lights provide an exotic look, and painted interior lifts the mood of the user. 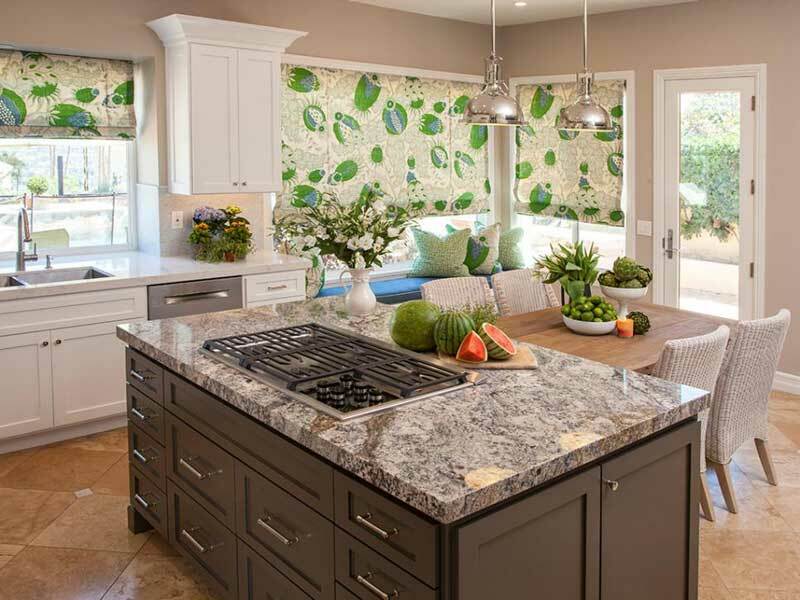 The white cabinetry appliances are hidden and extended to the ceiling for extra storage, while a soft spring green on the island adds an unexpected punch of color. Designing at its top form. A mix of vintage style and modern convenience, this design steals the show. 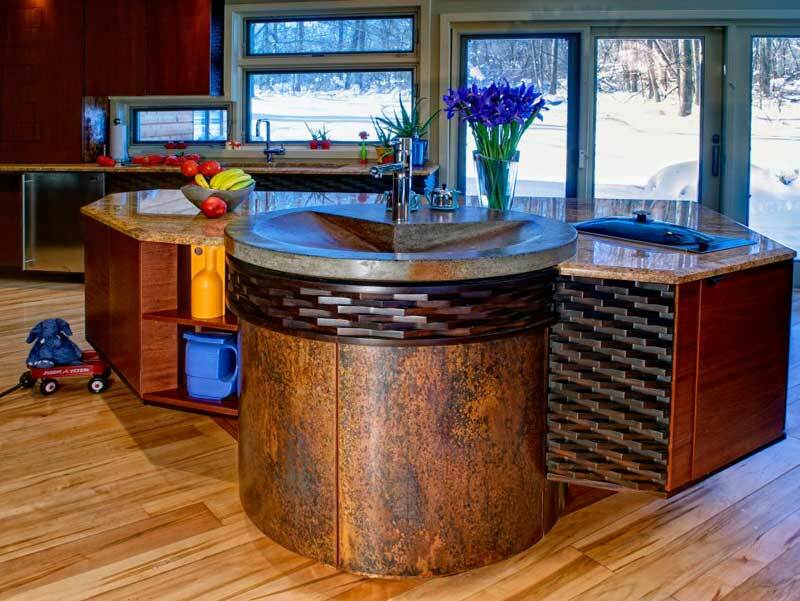 Its semi circular countertop saves space as well as improves the look. Inviting and compact at the same time, this should definitely be your kitchen. This one is for that close-knit family. There are many conveniences provided by this kitchen with its sink, built in microwave, and storage drawers. Handy, yet compact. Superior design and simple yet gorgeous finishing. This kitchen design can never be overlooked by anyone. Spacious cupboards, wide countertop and all with a modern look. What more can one ask for! 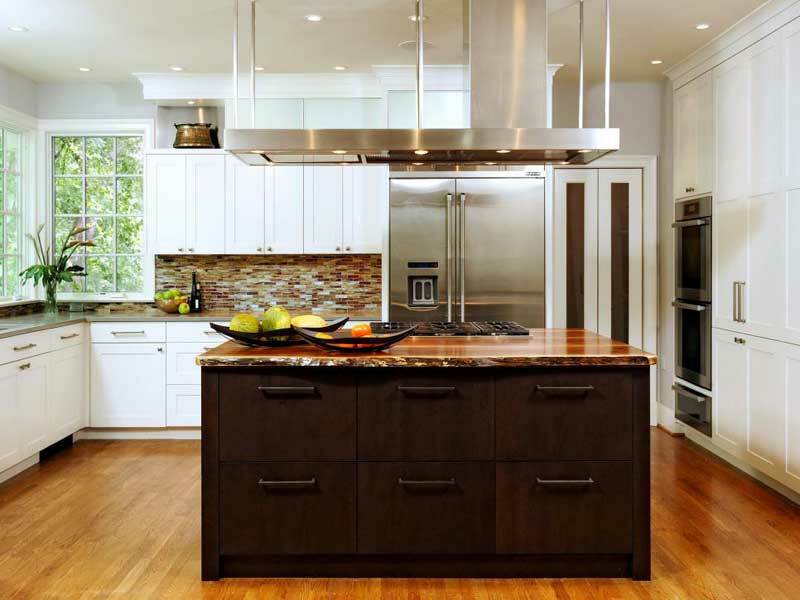 We have here a white transitional chef’s kitchen with an ideal triangle kitchen island that is tidy, neat and shapely. This triangular shape provides additional space and comfort. Every user’s dream is to own one such kitchen island. 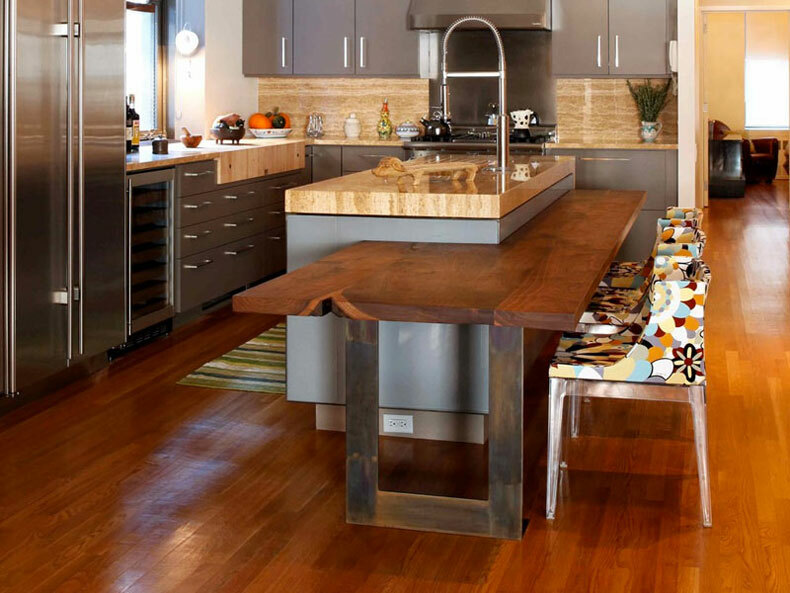 This very unusual T-shaped kitchen island allows users to perch on the stools to face each other. It anchors this cottage-style kitchen. It’s T-shaped counter-top adds the required spice to the otherwise simple interior. There is an effective contrast with deep blue subway and the cabinetry. Also, there is created an inviting charm throughout the space with a muted yellow wall color and warm-toned wood floors. Inviting, yet restrained. This design is for every friendly guy who have occasional visitors. The globe lighting completely changes the ambiance and lifts its beauty to another level. The white counter-top as well as cabinets provide the required serenity to go with it. Fantastic! Elegance, thou name is this. 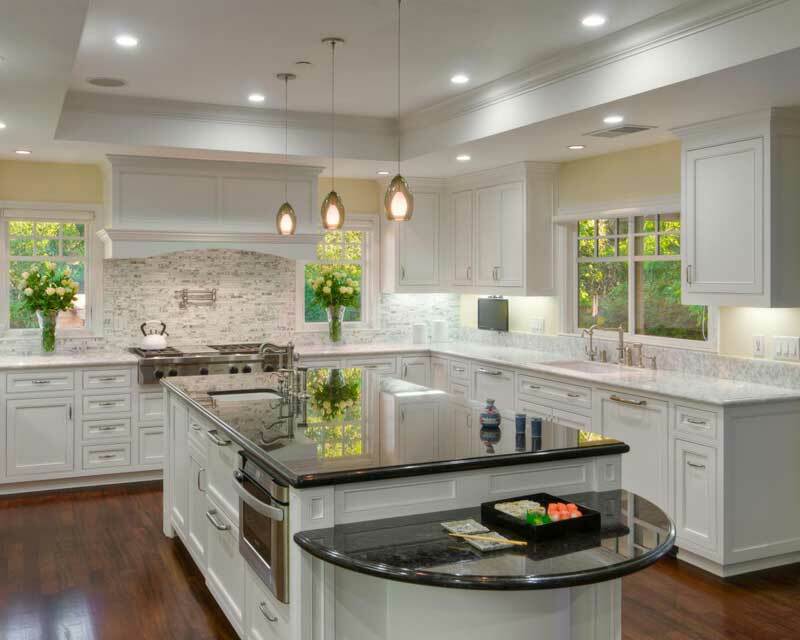 The focal point of this amazing kitchen is an over-sized white island with a stunning marble counter-top. With this island is provided an ample prep and storage space while also accommodating three bar-stools for casual dining. 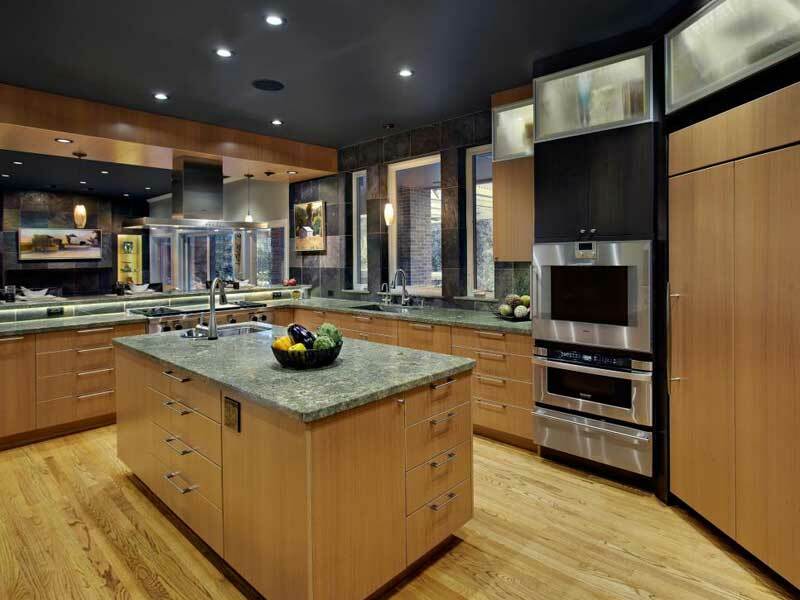 The resilient look is reached with dark granite counter-tops. An all white interior with a stunning table of marble, what more would a user ask for! Regal, indeed. There’s something seductive and passionate about the color black. When you mix these emotions, you get this design! The natural beauty of wood with the classic beauty of black marble is an exotic combination. Another one for the holiday mood; it refreshes and soothes you. 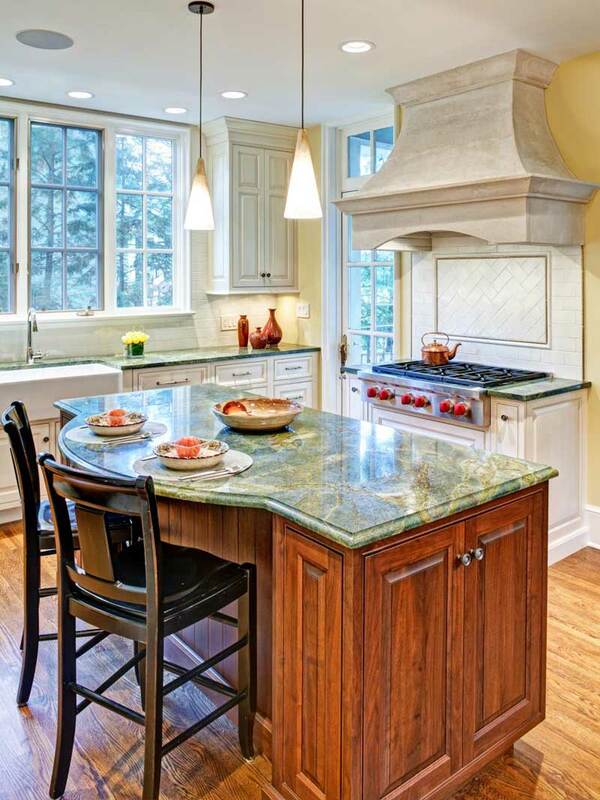 Green marble top makes you feel closer to nature, and the wood adds to the feeling. Once you enter this kitchen, the atmosphere changes in a moment.